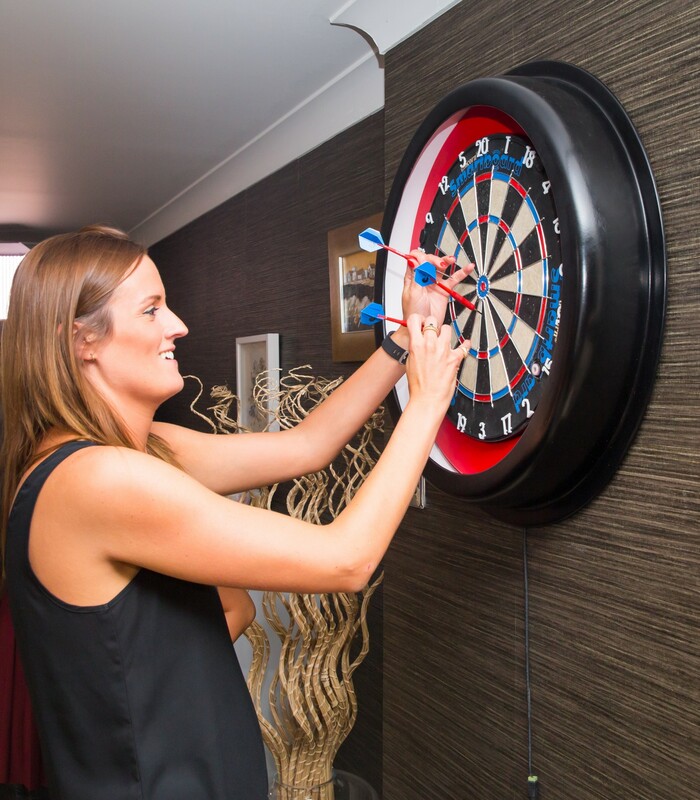 A high quality, traditional bristle board with the addition of instant app-enabled scoring technology connected through Bluetooth LE, built into the dartboard. 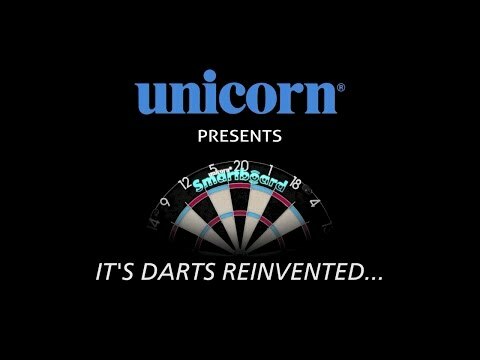 For over 75 years, Unicorn Darts have been at the forefront of innovating darts technology. Now, we introduce the revolutionary new Unicorn Smartboard, the world’s first app-enabled auto-scoring dartboard. With instant scoring, made possible by the amazing Unicorn Scorebuddy app. You can play 8 exciting games suitable for all ability levels. 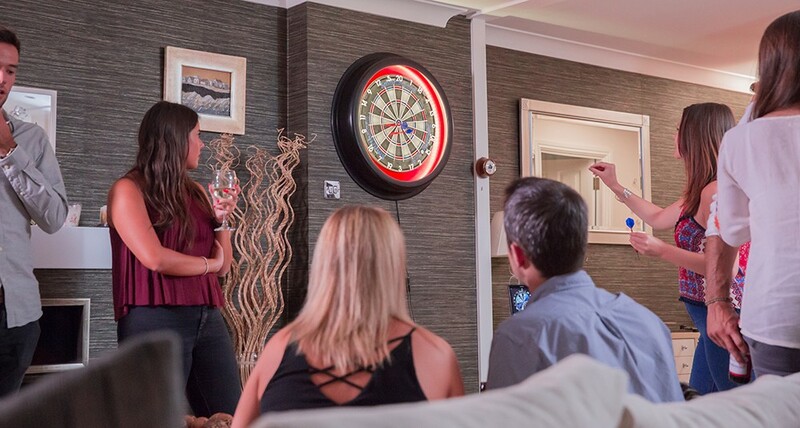 Either social or professional, it’s darts re-invented to be fun for everyone! With Bluetooth LE connectivity, the Unicorn Smartboard instantly transmits the score of every dart to the Scorebudy app on your mobile device or tablet. Included in the Scorebuddy app is the ability to auto-score 8 different game modes, ranging from the traditional 01 games to ‘Around The World’. The ability to play with up to 8 players in doubles, or 4 in singles, means that the Unicorn Smartboard is suitable for all abilities. You can also face the ultimate test in challenging the Scorebuddy Robot to a game-type of your choosing. The ScoreBuddy app also allows players to save specific legs and games to save their best performances or to track progress over time. 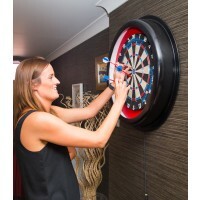 The Smartboard comes complete with 6 steel-tipped darts, although any steel-tipped darts are compatible, and is also fully portable with no mains connection required. Our Oche Mate measuring tape is also supplied to correctly measure board height and oche standing position. Just insert 3 x AA batteries (not included with Smartboard) and you are ready to go! 1 x Oche Mate measuring tape is supplied to correctly measure board height and oche standing position. How do I connect my Smartboard to my device? Press the start button on your Smartboard then open the Scorebuddy app on your device, remember to ensure that Bluetooth is turned on. What devices can I use with Smartboard? Smartboard uses Bluetooth LE to connect with your device for further information please contact the device manufacturer. Can I use any darts with my Smartboard? Yes, you can use any steel tip darts. See our full range of Steel Tip Darts here. For further assistance search Help within the Scorebuddy App, or alternatively please contact us. Fantastic piece of technology, makes darts so much more fun!! !